The elevated Central Artery in the early 90s. 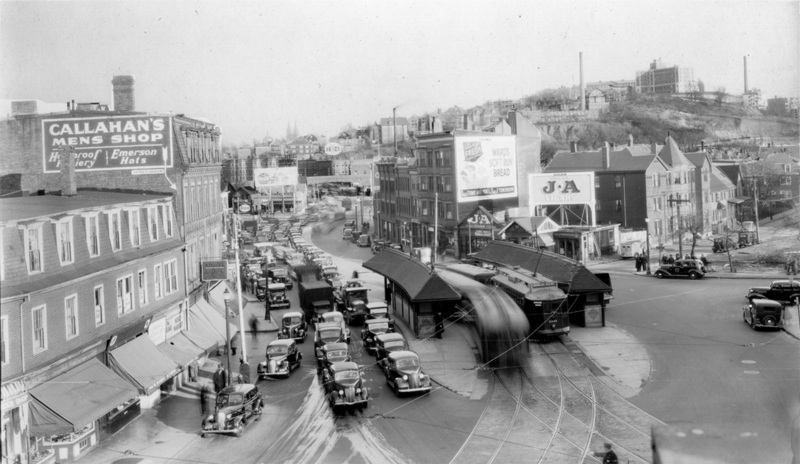 At left is the Haymarket Square Garage, up ahead is the Boston Garden & at right is the North End. As car traffic through Boston continued to grow over the years, it became clear that Boston's road infrastructure would eventually need to be upgraded. Roads that were planned to accommodate horse-drawn and streetcar traffic were proving to be too narrow to handle the streams of traffic passing through the city by the day. 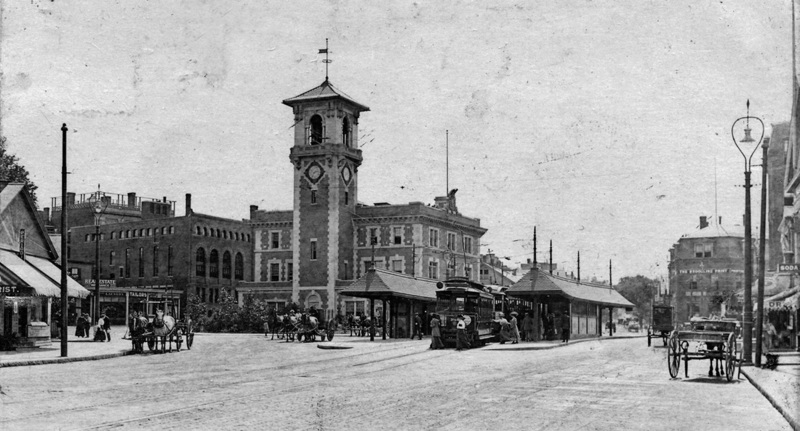 Traffic through Brookline's Village Square in 1910. As you can see, the main sources of traffic flow are streetcars—there are some horse-drawn buggies, but not many. Traffic through Village Square by 1937. Over 27 years, the square has become thoroughfare for car trav for drivers of private cars in addition to a major streetcar transfer point. Accordingly, it became clear that higher-capacity roads would have to be built through Boston to accommodate the new cars. In the mid-1920s, a master plan was put out for highways to be built through Boston in the near future. Highways proposed then include the Southwest Corridor, then proposed to be routed along Blue Hill Avenue, and the part of the proposed Inner Belt that later became Melnea Cass Boulevard, then branded as the "Roxbury Connector." 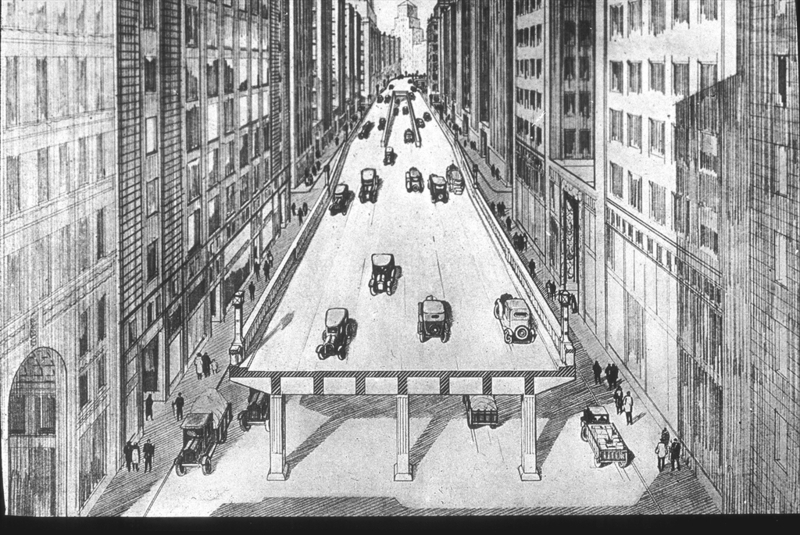 1920s diagram for the proposed downtown Boston elevated highway. The highways proposed in the roaring twenties were not to be built for some time. In 1929, the Great Depression hit the USA, followed closely by World War II and the depletion of resources and workers drafted for war. Following World War II, in 1948, a new plan for highways to be built through Boston was published. The highways proposed included the downtown elevated highway, which together with the Southeast Expressway would make I-93, the first highway constructed in Boston. For more on the highways proposed in Boston, and those that were and weren't built, see "Boston's Cancelled Highways"
1948 map of the highways proposed to be built through Boston. These included the new downtown elevated highway (I-93) along with the Southeast Expressway (also I-93), the Southwest Corridor (I-95), the Mass Pike (I-90), Rt. 3 through Cambridge, I-93 North, I-95 through Chelsea and the I-695 Inner Belt. Between 1954 and 1959, I-93 was constructed through Boston. South of downtown, the Southeast Expressway cut its way though Dorchester with some, though relatively minimal, property demolition required, as the highway ran along the New York, New Haven and Hartford Railway's existing right-of-way. I-93 passing under Savin Hill Avenue through Savin Hill in Dorchester today. On the left is Savin Hill Station on the MBTA Red Line, and on the right is Savin Hill "Over the Bridge." 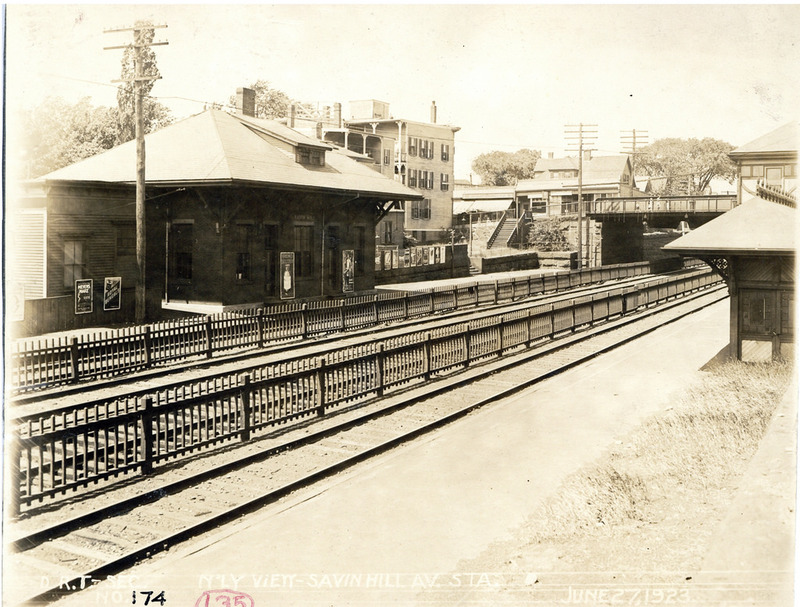 The "Savin Hill Avenue" station in the early 1920s in the same location. In order to build the Southeast Expressway, some buildings along the ROW were demolished so as to widen the ROW enough to fit both rail and automobile travel lanes.